Idea of lean manufacturing is an optymization of production plant in scope of production effectiveness and elimination of muda. During the cost optimization it is important to choose the right tools and take the right actions else you will risk that you will not cut the costs but you will raise them instead! Platform trolleys offered by us are perfect solutions for the companies which want to improve the internal logistics implementing tugger trains and do not have very sophisticated transport needs to introduce a complete intralogistic system. 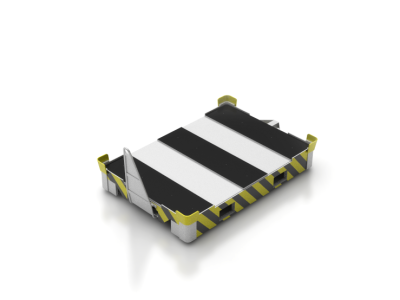 Platform has additional corner units which allow to stack the platforms safely which significantly saves the space needed to store them. Open upper surface is suitable to transport pallets and containers, handle to easily manevour platform. Additionally platform has a specially designed fork lift pockets. Diagonally positioned castors ensure the good traction qualities and help to retain the trajectory of tractor. It exists in three different sizes: 1300×1200, 1200×1000 and 1200×800 [mm]. 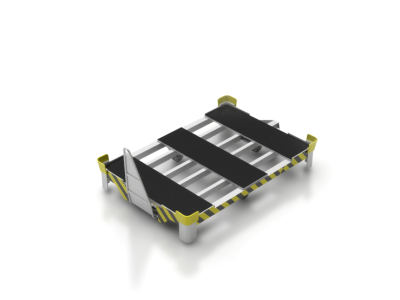 The most common version of transport platform designated to be used in internal logistics. It contains additional corner units for safe stacking and open upper work space. Diagonally positioned castors give good traction abilities and ensure that it will retain the trajectory of the tugger train. It comes in different sizes: 1200×800, 1200×1000 and 1300×1200 [mm]. It is the newest standard transport platform which is being produced by our company. 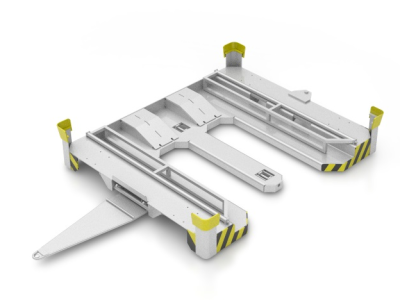 It gives the unique possibility to load and unload the containers of the platform with the use of pallet truck. It is available in one type and allows to transport containers of 1200 x 1000 and 1200 x 800 [mm] dimensions.